A lesser prairie chicken photographed in New Mexico. The Permian Basin Petroleum Association said regulations would impede operations and cost hundreds of millions of dollars in oil and gas development in one of the country’s most prolific basins. The birds live in the Panhandle and western parts of the state, a habitat shared with the oil and gas and wind energy industries. Oklahoma officials filed a lawsuit over the bird’s endangered listing. The lesser prairie chicken is particularly sensitive to “habitat fragmentation,” and has been designated the species with “the greatest conservation need in Oklahoma.” Two million lesser prairie chickens used to roam throughout Oklahoma and four neighboring states, but in recent years, the population dropped to about 17,000, Allan Janus with the Oklahoma Department of Wildlife told StateImpact last year. … the Western Association of Fish and Wildlife Agencies says the population increased by 25 percent this year to 29,000 birds. Opponents of the bird’s endangered listing said the resurgence was evidence that voluntary conservation efforts were working and that drought conditions, which have ended throughout much of the habitat, were one of the main reasons for the bird’s recent population decline. Many – like those for the sage grouse – are enormous undertakings involving millions of acres. It will take time to get these efforts negotiated, subscribed and implemented. Judging these efforts by a forward-looking examination of their potential success rather than a backward-looking review of their actual success will mean that they have a much greater chance at successfully fending off listings and should incentivize industry to keep creating and participating in them. And that’s good for both the species and for industry. Betsy Searight and her husband John drove from all the way from New Jersey for this opportunity: Wake up at 4 a.m., huddle against the cold, and sit silently and motionless for hours hoping to watch a Lesser Prairie Chicken peep show. After a long fight between Oklahoma and the U.S. government, the Lesser Prairie Chicken goes on the federal threatened species list later this month. To find out how the listing will affect Oklahoma and why the bird is worth protecting, we took a trip to the High Plains of northwestern Oklahoma. It's prairie chicken mating season! Still, it's tough being a lesser prairie chicken these days. This type of grouse once spanned an enormous area, though now they survive mainly in pockets of Oklahoma and Kansas. Their numbers are plummeting; in 2012, the population dropped by half. But after they were recently listed as a threatened species by the U.S. government, complaints of federal overreach and lawsuits have followed. A U.S. district judge has ruled that a lawsuit over the status of a threatened chicken species will stay in Tulsa. Oklahoma's attorney general, along with the attorneys general of North Dakota and Kansas, filed a lawsuit against the U.S. Fish and Wildlife Service. 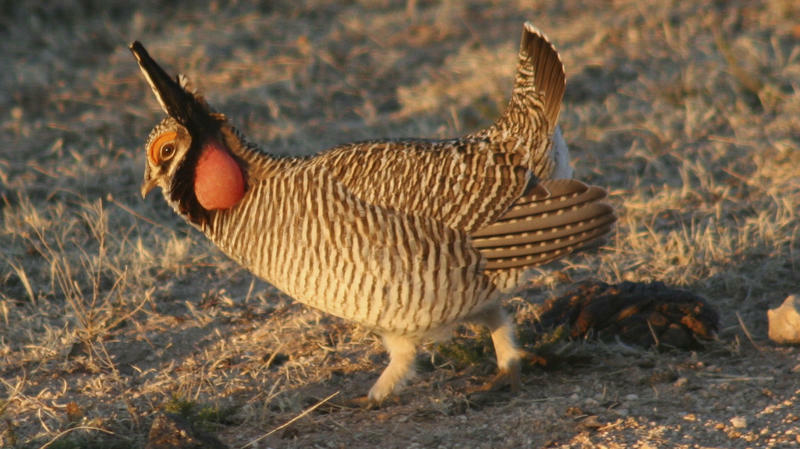 They claim the federal agency improperly reclassified the lesser prairie chicken. In doing so, the state lawyers say it increased the environmental burden on oil and gas producers, agricultural operations and the states. The Oklahoma Association of Conservation Districts is partnering with a private oil and gas pipeline company to help protect the habitat of the Lesser Prairie Chicken. The association announced on Tuesday its plans to work with OklahomaCity-based Access Midstream Partners. The plan calls for Access Midstream to donate funds that will be used to provide incentives to landowners to preserve the bird's habitat in western Oklahoma.